Make the most out of your day! Single Day tickets are a great way to experience royal fun in one day! Tickets are available to buy online and at the gate. Visit our parking page for details and rates. Don't let a cloudy day keep you away! Dutch Wonderland is pleased to provide a second chance for a day of fun in the sun! If it rains for more than one (1) consecutive hour during your visit to Dutch Wonderland and you decide to leave the Park for the remainder of the day, stop by Guest Services as you exit and present your ticket stub. You will be issued a single-day admission ticket valid for any day during the remainder of the summer season, Happy Hauntings or Dutch Winter Wonderland. You must have your ticket stub to receive a rain ticket. Rain tickets will only be issued on the day of your original visit at the Guest Services Office. There are a variety of great food and beverage items in-park suitable for every appetite and diet. Have a sit-down meal at Merlin's themed restaurant, or pick up a quick snack at one of our many food shacks. Enjoy the last three hours of the Park the night before you visit us for a full day – FREE! Any full day ticket, regardless of where it is purchased is eligible to be Previewed. Combo Tickets can either be Previewed at Dutch Wonderland OR Hersheypark (not both). Please visit Hersheypark.com for details on their Preview Plan. Two Day Flex Tickets can be Previewed once. The only tickets that are not eligible for Preview are Twilight Admissions. Preview must be used prior to your full-day visit. Preview after 3:00 pm when the Park closes at 6 pm. Preview after 5:30 pm when the Park closes at 8:30 pm. In order to preview the park, please bring your ticket or printed online ticket to any ticket booth to be stamped when you enter. During Happy Hauntings and Dutch Winter Wonderland, Preview begins an hour and a half prior to park close. Please see our Calendar & Hours for operating dates and times for these events. Enjoy the last three hours of the Park during the summer 2018 season at a discounted rate! Twilight tickets can be purchased at any Dutch Wonderland ticket booth April 28-October 7, 2018. 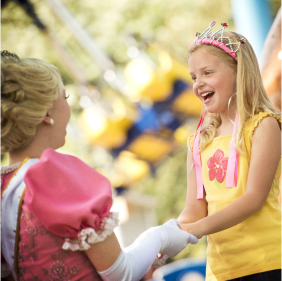 Royalty Twilight tickets for ages 3+ are $21.99 each. Twilight rates begin after 3:00 pm when the Park closes at 6 pm, and after 5:30 pm when the Park closes at 8:30 pm. Twilight tickets must be purchased at the gate only, and cannot be purchased online. ALL hand-carried items, including backpacks and hand bags, are subject to search. Metal detection equipment may be used. Guests are encouraged to keep non-essential items in their vehicles. Thank you for your understanding and cooperation. The First Aid Stations are located near the Wonderland Special Train Station at the front of the Park and in Duke's Lagoon. If immediate first aid is needed, ask any Park employee for assistance. Items may be identified and claimed at the Security Office located next to Junction Rentals toward the front of the Park. To leave and re-enter the Park on the same day, please have your hand stamped at the Park exit. Children ages 12 and under must be accompanied by an adult to enter the Park. If you purchase a ticket to Dutch Wonderland and don’t plan on staying for more than 45 minutes from the time of entry into the Park, we will refund your ticket. Everyone entering the Park must have a valid admission ticket. This program is only valid on tickets purchased at Dutch Wonderland on the day of your visit. You must visit Guest Services (located in the castle at the front of the Park) on the day of your visit to obtain your refund. This program is meant for first time visitors who are unsure how their children will respond to an amusement park and guests who want to purchase food and beverage items from inside the Park. We will not process refunds for this program over the phone or by mail. You must purchase your ticket, visit for less than 45 minutes and obtain your refund all on the same day. 45 minutes based on when your ticket is scanned at entry. Our goal is to accommodate our guests with disabilities to the fullest extent possible and in compliance with law. Please see our Accessibility guide, located on our Park Policies page, to learn more. Looking for a way to raise money for your non-profit organization? Call 1-866-FUNatDW (386-2839), e-mail info@dutchwonderland.com, or visit our Fundraising page for information about our fundraising program. Ride operators and attendants are not responsible for articles left by patrons at the ride stations. Neither Dutch Wonderland nor its employees assume responsibility for the loss of, or damage to, personal property. Locker storage is available for a nominal fee on a first-come-first-served basis. See the Park map and guide for locations. Deliberate line jumping that inconveniences other guests may result in dismissal from Dutch Wonderland without compensation or refund. Loitering on Dutch Wonderland property is prohibited. Personal food and beverage items, coolers, radios, and/or sound emitting electronic devices are not permitted and must remain outside the Park. We do permit one water bottle per person as well as some small snacks to be brought into the park. Weapons of any type and laser light pointers are never permitted in the Park. For your safety and health, all Park visitors are required to wear shoes and shirts at all times. For your safety and the safety of our other guests, we do not allow "wheelie" shoes in the Park. As a courtesy to others, modest dress is expected of all guests. Revealing or offensive clothes are not considered appropriate. While in Duke’s Lagoon water play area, modest swimwear may be worn. Footwear must be worn by children and adults when riding the Pipeline Plunge. String bikinis, thongs, and men's bikini bottoms are not appropriate. Swim diapers are required on infants and toddlers while in Duke's Lagoon. When exiting the water attraction area, we ask that you change to more appropriate attire (i.e. shoes, shorts, and shirts). Dutch Wonderland reserves the right to address these issues with all guests. Your cooperation is appreciated. For your safety, as well as the safety of other guests, skate shoes are not permitted while visiting the Park. For the well-being of our guests, smoking is restricted to a designated area. This Clean Air Proclamation was developed in response to guest requests for a balance between the safety of children in the Park and the needs of guests who smoke. Please see the Park Map to locate the designated smoking area. Bring your own or rent one of our strollers. Strollers are available for a rental fee at Junction Rentals, near the Wonderland Special Train Station at the front entrance of the Park on a first-come-first-serve basis. Whether it’s a company picnic, a group outing or a birthday party, Dutch Wonderland is the perfect place to hold your group’s next event. Great packages are available that make it easy for you to enjoy a fun-filled day designed especially for your group. Visit Group Sales for more information. Dutch Wonderland does not permit food or drink to be brought into the Park, but we do permit one water bottle per person as well as some small snacks to be brought into the park. Picnic lunches can be enjoyed outside the park in our picnic pavilion. Lockers are available on a first-come-first-serve basis for storing personal items. Changing rooms and lockers are available near the Pipeline Plunge and in Duke's Lagoon. Lockers are also located at the front of the Park, next to First Aid. A nominal fee is charged for lockers based on the size. Dutch Wonderland is not responsible for lost or stolen items. Nursing Mothers can utilize our Nursing Mothers Station located near the Wonderland Special train station at the front of the park. Our Nursing Mothers Station has a rocking chair for mom and a kid-sized chair for older brothers or sisters. The Nursing Mothers Station also has a changing table for your convenience. Our goal is to ensure that your visit to any one of our Dutch Wonderland Family Entertainment Complex properties - Dutch Wonderland Family Amusement Park and Old Mill Stream Campground - is all that you expected. If there is anything that we can do to improve your experience, please feel free to contact Guest Services toll free 1-866-FUNatDW. There are plenty of other family activities in the Lancaster County area! Visit LancasterPA.com to learn more about other local events, attractions, and things to do in the area. Stay in the know with Dutch Wonderland's upcoming events by visiting lancasterpa.com/events. With a little planning ahead, everyone can enjoy a day at Dutch Wonderland! Here are a few tips to make your trip to Dutch Wonderland more enjoyable for the entire family. For the most enjoyable day at Dutch Wonderland, you and your family should have a plan for the day. Here are a few suggestions to get you started. 1. If you and your family decide to split up, be sure you pick an identifiable meeting place. We suggest meeting at the Wonderland Special Train Station at the front of the park. Make sure everyone has a watch! 2. Communication is key. Whenever possible, carry a fully-charged cell phone so you can keep in touch with your family. For our younger guests, two-way radios are a fun option! 3. Upon arrival, point out the Dutch Wonderland staff members and security personnel to your children and let them know that these are friendly faces they can go to in case they get separated from your group. It is important that they understand that the staff is there to help them. 4. While it’s extremely unlikely you will need medical attention while at the Park, be sure you have all family medical information easily accessible. Every kingdom has its rules, including Dutch Wonderland. Our rules and regulations are found above as well as in our Park Map and Guides. They are designed to make your experience more enjoyable. If you know the rules before arrival, you will save time and ensure that you pack only necessary items. Stay cool, protected and hydrated! Although Dutch Wonderland offers plenty of shady spots, it’s always wise to pack sunscreen and reapply as necessary. A sunburn is no fun after a day in the Park! Make sure to drink lots of water too – it’s your best friend for staying hydrated. Remember you will be doing a lot of walking on hot paved surfaces – cool, comfortable shoes are best. Flip flops and loose fitting sandals are not recommended as they do not protect the feet. If you have long hair, tie it up. Don’t wear clothes that may have things that have the potential for getting caught, such as drawstrings in pants or hoods. And don’t forget to remove your hat before getting on the Kingdom Coaster! Ride height requirements and safety guidelines are there for your protection and the protection of your children. Upon arrival at the Park, measure your child on our precious gems chart to see if they are a ruby, sapphire, amber, emerald, amethyst or aquamarine gem! Once you know what gem your child is, you can check the ride signs and Park map and guide to see what rides your child can enjoy. If you don’t understand a guideline, please ask the ride operator to explain it. Don’t be afraid to ask the attendant to recheck your safety equipment before starting the ride. Save the large meal for after the Kingdom Coaster! Almost all of the rides at Dutch Wonderland are mild kid-friendly rides. But sometimes even the mildest ride can make small tummies go for a loop. Save larger meals and snacks for after you’ve ridden the bigger rides. If you would like to bring medications and bandages to the Park, we suggest you pack them in a clear plastic bag. All bags are searched before entering the park and this will speed up the process immensely. There are two first-aid locations located in Dutch Wonderland – one near the Wonderland Special Train Station at the front of the park and one in Duke’s Lagoon. Please refer to your Park map and guide for exact locations.